Home / Prayer / Awrah for Men and Women in Salah (Prayer)? 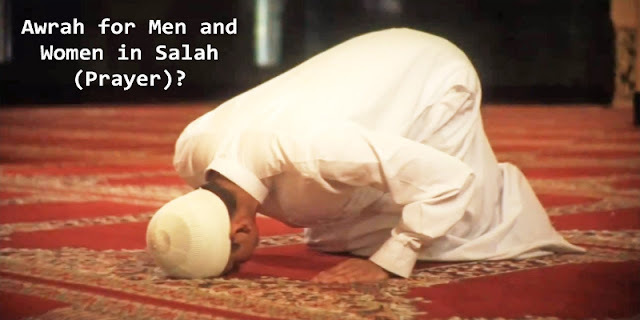 Awrah for Men and Women in Salah (Prayer)? Generally speaking, men's `awrah (private parts) is what is between navel and thigh whereas women’s `awrah is the whole body except face and hands. Ibn Hazm mentions that Hubair ibn Al-Huwairith looked at Abu Bakr's thigh when it was uncovered, and that Anas ibn Malik came to Qas ibn Shammas when his thigh was uncovered. It is related from Umm Salamah that she asked the Prophet, "Can a woman pray in a long shirt (like a night shirt) and head covering without a loincloth?" He said, "If the shirt is long and flowing and covers the top of her feet (i.e. it’s allowed to do do)." (Abu Dawud) The scholars say it is an authentic hadith in mauquf form (as a statement of Umm Salamah and not that of the Prophet). It is also related that on being asked about kinds of garments a woman is allowed to pray in, `Aa'ishah answered, "Ask `Ali Ibn Abu Talib and then tell me what he says." 'Ali's answer was, "In a head cover and a long flowing shirt." On conveying this reply to `Aa'ishah, she said, "He has told the truth." The clothes worn must cover the `awrah, even if they are tight enough to highlight those features. If the clothes are so thin that one's skin color can be seen, they are not suitable for prayer.